My First Desk by Alex toys is soo cute I wish they had one big enough for me! Shaped like an old style school desk it small and compact so its great almost anywhere and it actually offers very generous storage abilities underneath and in the back pocket. Honestly my favorite feature of the desk is the fact that the "desktop" is chalk friendly. There is also a storage area on the desktop itself to hold all your pens and even your chalk if you wish! 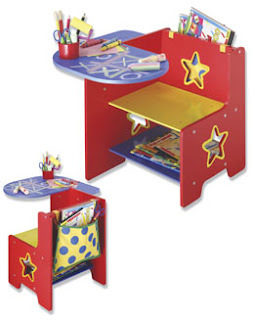 The desk is also completely adjustable for left or right handed children!!! My First Desk is available on Amazon!